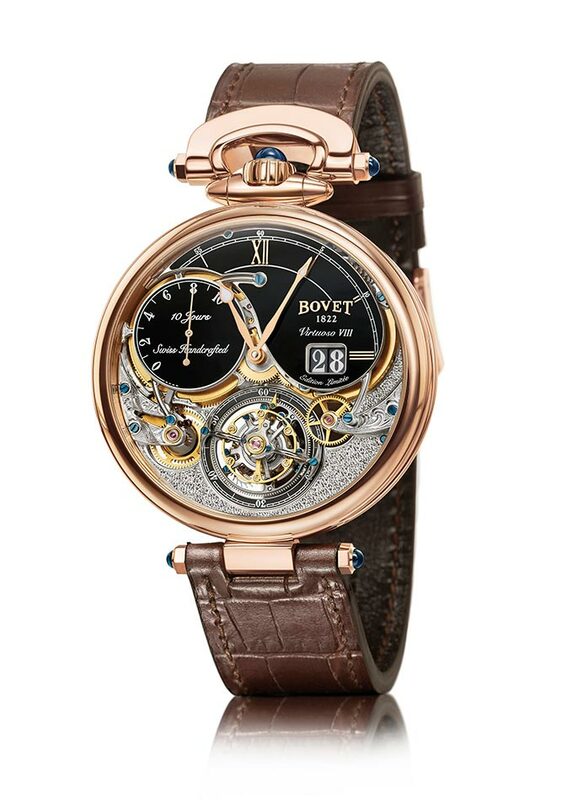 The Virtuoso VIII 10-Day Flying Tourbillon Big Date celebrates the 195th anniversary of Bovet. 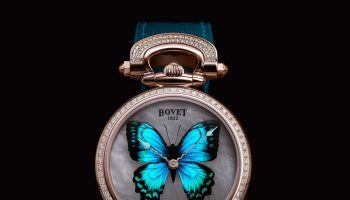 A glorious celebration of watchmaking that shows Bovet’s drive to elevate traditional artisanal watchmaking to new heights. The Virtuoso VIII 10-Day Flying Tourbillon Big Date is part of the Fleurier Grandes Complications Collection which is dedicated to constantly elevating traditional artisanal watchmaking to new heights. But the Virtuoso VIII is not all traditional. 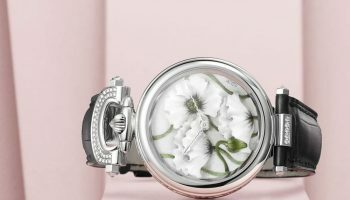 The Flyting Tourbillon is the first timepiece in the Fleurier Collection to reprise an inclined crystal aperture along the 12 o’clock to 6 o’clock axis. 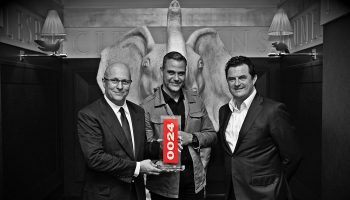 This innovative concept creates new perspectives for calibre architecture, as well for the decoration and display of functions. The movement of Virtuoso VIII 10-Day Flying Tourbillon Big Date also features a number of significant innovations, as well as three of the patents pioneered by the Braveheart Tourbillon, which was initially presented in 2015. But above all, the Virtuoso VIII is the ultimate expression of an artisanal watchmaking tradition since 1822. The new calibre in the Virtuoso VIII 10-Day Flying Tourbillon Big Date uses a single barrel, which provides over ten days of autonomy while maintaining the oscillations of the balance wheel at 18,000 vph. The calibre shows an architecture typical of19th-century watches, with a full plate and bridges hollowed out into a series of scrolls. 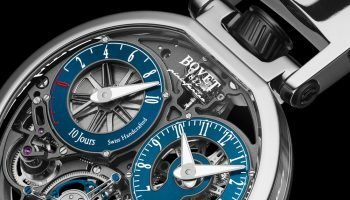 Bovet’s double face flying tourbillon has already demonstrated its full chronometric potential. Its fixed point in the centre of its axis together with the distribution either side of the escapement and balance-spring give it a balance that drastically reduces the lever-arm effect and friction at the pivot point. 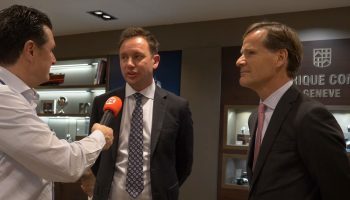 To further improve the performance of this tourbillon, a new regulating organ has been developed. 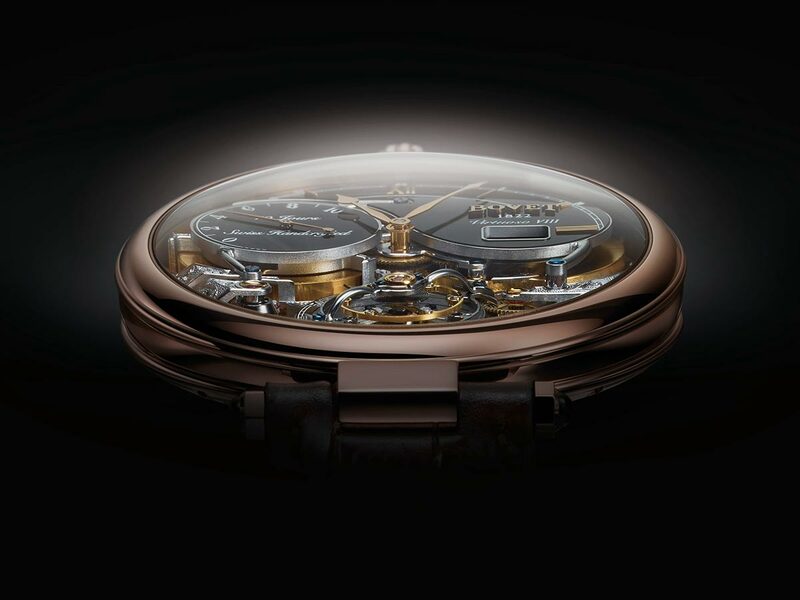 The balance-spring in the movement has been specifically calculated for this calibre and balance wheel by Bovet. The hand-finished wheels, traditionally burnished pivots and teeth cut using traditional artisanal methods also improve the chronometric performance of this calibre.